Made From Resin-Bonded Aluminium Oxide. KW1-KW17, PA20-PA38, PA41-PA49, PA60-PA78, PH4-PH44, PH49-PH50, PO (Isle Of Wight) TR (Isles Of Scilly) ZE (Channel Isles). Diamond Burr Rotary Tool Bit Set. Fits Most Standard Rotary Tools. Diamond Coated. KW1-KW17, PA20-PA38, PA41-PA49, PA60-PA78, PH4-PH44, PH49-PH50, PO (Isle Of Wight) TR (Isles Of Scilly) ZE (Channel Isles). Set Includes: 35x Cutting Discs, & 1x Mandrel. Ideal For Cutting, Trimming & Deburring. KW1-KW17, PA20-PA38, PA41-PA49, PA60-PA78, PH4-PH44, PH49-PH50, PO (Isle Of Wight) TR (Isles Of Scilly) ZE (Channel Isles). 3Pc Rotary Tool Grinding Stone Set. Fits Most Standard Rotary Tools. KW1-KW17, PA20-PA38, PA41-PA49, PA60-PA78, PH4-PH44, PH49-PH50, PO (Isle Of Wight) TR (Isles Of Scilly) ZE (Channel Isles). 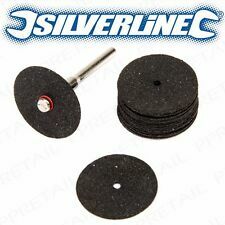 Silverline 289305 HSS Saw Disc Set (6 Piece). 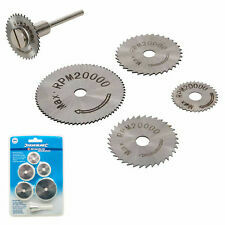 Includes 5 x HSS saw discs: 22, 25, 32, 35 and 44mm. Loose Leaf Buffing Wheels. Mandrel Fits Most Standard Rotary Tools. KW1-KW17, PA20-PA38, PA41-PA49, PA60-PA78, PH4-PH44, PH49-PH50, PO (Isle Of Wight) TR (Isles Of Scilly) ZE (Channel Isles). Fits Most Major Rotary Tools. KW1-KW17, PA20-PA38, PA41-PA49, PA60-PA78, PH4-PH44, PH49-PH50, PO (Isle Of Wight) TR (Isles Of Scilly) ZE (Channel Isles). 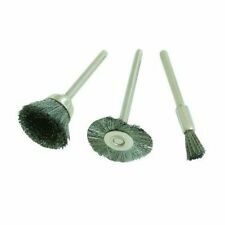 3Pc Steel Wire Brush Rotary Tool Set. Compatible With Most Standard Rotary Tools. KW1-KW17, PA20-PA38, PA41-PA49, PA60-PA78, PH4-PH44, PH49-PH50, PO (Isle Of Wight) TR (Isles Of Scilly) ZE (Channel Isles). 135w Motor. Tool Includes 33 Piece Accessory Set This item is being supplied with an extra105 Piece Accessory Set. The perfect accessory kit for the serious hobbyist which can be used with the Silverline and other multi-use craft tools. Mandrel Fits Most Standard Rotary Tools. KW1-KW17, PA20-PA38, PA41-PA49, PA60-PA78, PH4-PH44, PH49-PH50, PO (Isle Of Wight) TR (Isles Of Scilly) ZE (Channel Isles). Set Includes: 5 - 1/2" x 1/2" Drums & 5 - 1/2" x 1/4" Drums. 15W Engraver & Grout Remover Mini Rotary Tool inc Tips. 15W Engraver & Grout Remover Mini Rotary Tool. This is a 15W Engraver and Grout Remover Tool. Easy & Accurate Grout Removal. 4 out of 5 stars - 15W Engraver & Grout Remover Mini Rotary Tool inc Tips. 2 product ratings2 product ratings - 15W Engraver & Grout Remover Mini Rotary Tool inc Tips. Aluminium Oxide Discs. Fits Most Standard Rotary Tools. KW1-KW17, PA20-PA38, PA41-PA49, PA60-PA78, PH4-PH44, PH49-PH50, PO (Isle Of Wight) TR (Isles Of Scilly) ZE (Channel Isles). 105Pc Rotary Tool Accessories Starter Kit. 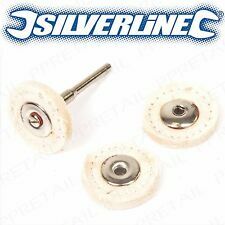 Genuine Silverline Product. Height: 40mm Iron Oxide For Use On. KW1-KW17, PA20-PA38, PA41-PA49, PA60-PA78, PH4-PH44, PH49-PH50, PO (Isle Of Wight) TR (Isles Of Scilly) ZE (Channel Isles). Fits Most Standard Rotary Tools. Ideal For Cleaning & Polishing. KW1-KW17, PA20-PA38, PA41-PA49, PA60-PA78, PH4-PH44, PH49-PH50, PO (Isle Of Wight) TR (Isles Of Scilly) ZE (Channel Isles). 7Pc Rotary Tool Rubber Polishing Wheel Set. Ideal For Polishing & Grinding. Fits Most Standard Rotary Tools. KW1-KW17, PA20-PA38, PA41-PA49, PA60-PA78, PH4-PH44, PH49-PH50, PO (Isle Of Wight) TR (Isles Of Scilly) ZE (Channel Isles). HSS Rotary Tool Bit Set. Made From HSS. Fits With Most Standard Rotary Tools. KW1-KW17, PA20-PA38, PA41-PA49, PA60-PA78, PH4-PH44, PH49-PH50, PO (Isle Of Wight) TR (Isles Of Scilly) ZE (Channel Isles). 6Pc Diamond Rotary Tool Cutting Discs. High RPM For Shaping, Cutting & Trimming. KW1-KW17, PA20-PA38, PA41-PA49, PA60-PA78, PH4-PH44, PH49-PH50, PO (Isle Of Wight) TR (Isles Of Scilly) ZE (Channel Isles). Disc Material: Resin-Bonded Aluminium Oxide. Set Contents: 5x Cutting Discs, & 1x Mandrel. KW1-KW17, PA20-PA38, PA41-PA49, PA60-PA78, PH4-PH44, PH49-PH50, PO (Isle Of Wight) TR (Isles Of Scilly) ZE (Channel Isles). 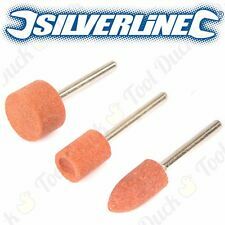 Silverline Rotary Tool Flexible Drive Shaft. 1 x Flexi Drive Shaft. 1 x Tommy Bar. KW1-KW17, PA20-PA38, PA41-PA49, PA60-PA78, PH4-PH44, PH49-PH50, PO (Isle Of Wight) TR (Isles Of Scilly) ZE (Channel Isles). 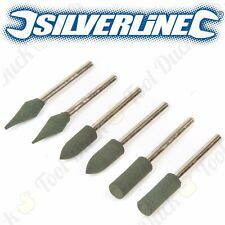 6Pc Pointed Rubber Polishing Rotary Tool Set. Fits Most Standard Rotary Tools. KW1-KW17, PA20-PA38, PA41-PA49, PA60-PA78, PH4-PH44, PH49-PH50, PO (Isle Of Wight) TR (Isles Of Scilly) ZE (Channel Isles). Diamond Burr Rotary Tool Set. 10 piece set of rotary burrs. Fit most standard rotary tools. Coarse Pitch Bolts & Screws. Stainless Steel Flange. 150g diamond coated. Button Head Allen Screws/Bolts. 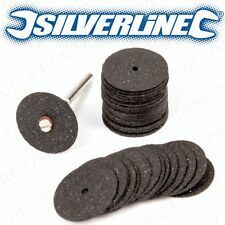 Genuine Silverline Rotary Tool Loose Leaf Buffing Wheel Kit 4pce. We're rated 5/5 for service! WE'RE HERE TO HELP! We'll get back to you as soon as possible! As described. Quick service. New arrivals. Soft Felt Wool Polishing Wheels. Fits Most Major Rotary Tools. AB31-AB38, AB40-AB56, BT (Northern Ireland) GY, HS, IM (Isle Of Man) IV1-IV28, IV30-IV32, IV36-IV49, IV51-IV56, IV63, KA27-KA28. 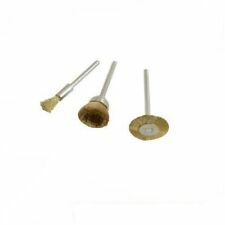 3Pc Quality Brass Wire Rotary Tool Wheels. Compatible With Most Rotary Tools. Compatible With Most Rotary Tools. KW1-KW17, PA20-PA38, PA41-PA49, PA60-PA78, PH4-PH44, PH49-PH50, PO (Isle Of Wight) TR (Isles Of Scilly) ZE (Channel Isles). Ideal For Sharpening, Polishing & Finishing Projects. Compatible With Most Rotary Tools. KW1-KW17, PA20-PA38, PA41-PA49, PA60-PA78, PH4-PH44, PH49-PH50, PO (Isle Of Wight) TR (Isles Of Scilly) ZE (Channel Isles). AB31-AB38, AB40-AB56, BT (Northern Ireland) GY, HS, IM (Isle Of Man) IV1-IV28, IV30-IV32, IV36-IV49, IV51-IV56, IV63, KA27-KA28. 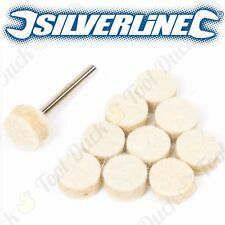 Genuine Silverline Rotary Tool Felt Polishing Point Set 11pce. PARTY & GIFT. WE'RE HERE TO HELP! We'll get back to you as soon as possible! We're rated 5/5 for service! We're here to help whenever you need us. Precision tool for detailed cutting, grinding and polishing. Spindle lock. Variable speed. We are able to demonstrate these products amongst others on our very busy, yet friendly trade counter. There is ample car parking space. Max speed 28,000rpm. We accept Cash on collection. Resin-bonded aluminium oxide discs for cutting, trimming and deburring. PARTY & GIFT. Includes 17 x 22mm discs. WE'RE HERE TO HELP! We'll get back to you as soon as possible! New arrivals. United Kingdom. 12 pc Set of Mounted small Grinding Stones! Ideal for grinding, sharpening, de-burring, sanding and rust removal! 6Pc Resin Cutting Disc Kit. Kit Includes 5x Resin Cutting Discs & 1 Mandrel. High Speed Discs Compatible With Most Rotary Tools. Resin Bonded Aluminium Oxide. AB31-AB38, AB40-AB56, BT (Northern Ireland) GY, HS, IM (Isle Of Man) IV1-IV28, IV30-IV32, IV36-IV49, IV51-IV56, IV63, KA27-KA28. 5 pc Set of Diamond Burr Drill Bits! 5 pc set diamond burr drill bits! 3 steel, 3 brass and 3 nylon brush wheels! Ideal for cutting, cutting off and slitting! 11 pc Set of 32mm Cutting Discs & a Mandrell With 3.17mm Shank! 10 x 32mm cutting discs reinforced with fibreglass ! Ideal For Polishing & Buffing. Fits Most Standard Rotary Tools. KW1-KW17, PA20-PA38, PA41-PA49, PA60-PA78, PH4-PH44, PH49-PH50, PO (Isle Of Wight) TR (Isles Of Scilly) ZE (Channel Isles). AB31-AB38, AB40-AB56, BT (Northern Ireland) GY, HS, IM (Isle Of Man) IV1-IV28, IV30-IV32, IV36-IV49, IV51-IV56, IV63, KA27-KA28. 216Pc Rotary Tool Start Accessory Kit. Height: 40mm Chromium Oxide. Polishing Fabric. Full Range of Bits For Endless Uses & Projects. Carry Case 1 Length: 265mm. KW1-KW17, PA20-PA38, PA41-PA49, PA60-PA78, PH4-PH44, PH49-PH50, PO (Isle Of Wight) TR (Isles Of Scilly) ZE (Channel Isles). 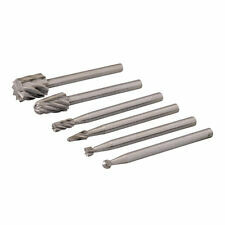 6 pc Set of HSS Milling Burrs with 3.17mm Shank! Ideal for milling, shaping and carving! 6 pc milling burr set! Assorted shape milling heads! 1/2" Rotary Tool Sanding Band Drums. 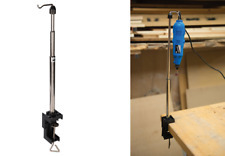 Mandrel Fits Most Standard Rotary Tools. 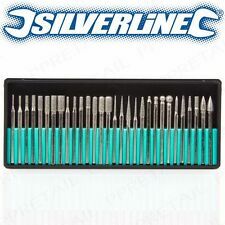 Silverline Tools 909214 DIY Engraver & Grout Remover .